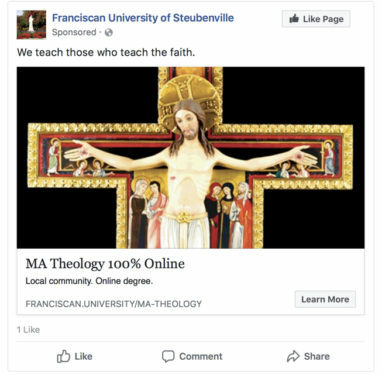 The university said the San Damiano Cross image was one in a series of ads it posted to Facebook March 29 to promote two of the school’s online master’s degree programs in theology and in catechetics and evangelization. The San Damiano Cross is the large Romanesque rood cross that St. Francis of Assisi was praying before when he is said to have received the commission from the Lord to rebuild the Catholic Church. The original hangs in Assisi, Italy. Editor’s Note: After media attention, the university’s ad has since been reinstated online. Facebook CEO Mark Zuckerberg testified in Congress April 11 about his company’s community standards.